When the first brethren arrived in the early 1900s, Miami was a village with fewer than one thousand inhabitants. It was a frontier town populated mostly by northerners, African-American laborers, and Bahamian fishermen. The earliest brethren testimony in Miami began around 1910 when several families from the northern United States joined the local fishermen on Sunday morning for the Lord’s Remembrance and Bible reading. Mirroring the population of Miami, this first gathering was composed of immigrants from the Northern U.S., the Bahamas, and Key West (the Key West Gospel Hall was established in 1902). At first, the Miami group met in the upstairs of a private home, located on what is today S.W. 9th Street. 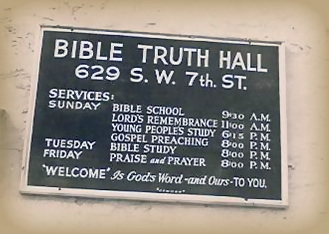 Those gathered at the Gospel Hall at 20th near Avenue H.
Within a short period of time, the group pooled resources and acquired a wooden building to house the first “Gospel Hall” in Miami on “20th near Avenue H.” There they continued in the established Sunday meetings as well as in a strong evangelistic effort. On the front façade of the new building was placed a sign listing the weekly schedule of meetings and inviting all to attend: “‘Welcome,’ Is God’s Word – and Ours – to You,” was stamped along the bottom of the plaque. The schedule included Sunday Bible School at 9:30 AM followed by the Lord’s Remembrance at 11:00 AM. In the evening, the Young People’s Bible Study began at 6:15 PM and was followed at 8:00 PM with the Gospel preaching service. The week was rounded out with the Tuesday Night Bible Study at 8:00 PM, and on Friday evenings, “Praise and Prayer,” also at 8:00 PM. Other meetings during the week included the Wednesday afternoon children’s Bible study, the weekly sisters’ meetings, and “Sewing Circles” where the ladies made articles for distribution to the poor and to be sent to missionaries. America’s entry into World War II in late 1941 led to a radical shift in Miami’s fortunes. The city and other parts of Dade County became a huge training base for thousands of men and women in the armed services. With their strong desire to see others come to know Christ as Savior, during the War the believers at Bible Truth Hall were very active in their ministry to American and foreign servicemen. Each Saturday night they would hold open air Gospel meetings in Bayfront Park to minister to the sailors and soldiers stationed there. There were also numerous Bible studies in the believers’ homes including a weekly study with Chinese sailors. The thriving little assembly on Seventh Street was as active as the city that surrounded it. During the second half of the 1940s, the young people’s group at Bible Truth organized a radio program that included a Bible message and special music. The programs were beamed internationally, reaching to the Bahamas. 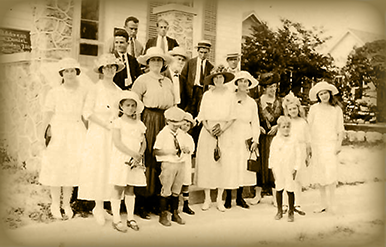 As the numbers in fellowship grew, the believers saw the need to add space to the building on Seventh Street. In 1949, a kitchen, two bathrooms, a fellowship hall, and two spare rooms were added. Hospitality was a hallmark of the believers at Bible Truth and so the rooms served double duty. They were used to house visiting missionaries and preachers and their families and, when not so occupied, they served as additional Sunday School classrooms for the many children that attended. By 1950, Dade County residents grew to over half million. The Chapel, too, added to the population boom as many of the young couples who had married after the War began their families. The work of the Lord among the young continued to be a central focus for the assembly including Sunday School, Bible studies, and evangelism ministries. To comply with growing regulations, during the 1950s the assembly was incorporated as “Bible Truth Chapel” and that name has remained ever since. However, everyone continued to refer to it simply as “Seventh Street.” During this time Mr. Dashfield, a visiting missionary who smuggled Bibles into Communist Russia, stayed at the missionary apartment at the back of the Chapel for a time. As a thank you for the warm welcome he received, he painted a sign to hang behind the pulpit which read (and still reads): “Jesus Christ is Lord.” That was the message that had come to Miami in the first decade of the twentieth century and that now, at its mid-point, was emblazoned over the little chapel. It served as a guiding principle for nearly 50 years and would point the way for the next generation. One of Miami’s defining moments came in 1959 with Fidel Castro’s Communist takeover of Cuba. The transformation of the island nation into a Marxist state led to a vast exodus of Cubans to Miami. During the 1960s and early 1970s, more than 150,000 Cubans settled in Miami and the surrounding areas, and in the process instituted the radical transformation of the city. The believers at Bible Truth Chapel saw this as an opportunity to extend God’s love to the refugees who were fleeing the island by the thousands. In 1962 the believers at Seventh Street opened the Chapel’s “back room” for Sunday evening breaking of bread services for Spanish-speakers. Soon, gospel meetings in Spanish were added and many came to know the Lord through this ministry. The Cuban immigrants were welcomed to all the activities at Bible Truth and encouraged to go on for the Lord. The Lord blessed this work and the “Spanish Assembly” began to grow, watered by the prayer and encouragement of the English-speaking believers in the “front” of the building. Thus, the “Calle Siete” fellowship was born. These were times of building relationships, learning from God’s Word, and of continued spiritual growth for the believers. With the move, a new generation also reconfigured the old traditions as youth work remained central to the believer’s vision. In the fall of 1979, Bible Truth Young Folks Hour, or B.T.Y.F.H., was started. Soon, the traditional Tuesday night Bible Study and Prayer meeting moved to Wednesday evening In the mid-1990s. The Tuesday night gospel outreach for young men was established, using sports as a ministry tool to share the Gospel of our Lord. The ministry at “BT” has continued to evolve. It is the enduring testimony of that great cloud of witnesses who were faithful and set the example of sharing the love of God with all who would listen. Today, the believers at Bible Truth Chapel represent a multitude of nations from across the Caribbean, Latin America, and from around the world including the far away Indian provinces. All are joined as one body because of their faith in the Lord Jesus Christ. May be it be so until our Lord returns. This short account is not intended to be a complete history of the brethren in Miami. To tell the story of God’s goodness to this fellowship would require volumes. However, the complete record has been perfectly kept by the Lord himself, who is the Rewarder of those who diligently seek Him. We trust this recounting will bring to remembrance the work, sacrifices, responsibility, and privileges of being part of God’s purpose and work.